The fourth volume in the series presents the thorniest music (see reviews of Volume 1,Volume 2 & Volume 3). Previous releases have been of more stylistically centre-of-the-road literature – volume 3 included Moeran, Rubbra and Rawsthorne for instance – but this one embraces serialism and does so, moreover, with great perception and instrumental finesse. Kenneth Leighton’s Partita was composed in 1959 and is cast as an Elegy, Scherzo and Theme and Variations. The opening is melancholy-expressive, Leighton taking the cello high, and suggesting Baroque figures in the March section that precedes the arriving of the Scherzo, a taut, nervy, syncopated affair with hints of Prokofiev in the piano writing. The variations are very well characterised and include a somewhat grudging-sounding but intense waltz, before Leighton unveils the longest variation, the last one, which beautifully lowers the temperature to end the work with a Chorale. It’s still relatively rare to encounter Elisabeth Lutyens’ music on disc so her Constants, Op.110, written in 1976, will be welcomed by those still curious as to her compositions. This is a work of deliberate constraint – not least in its rigorous use of intervals – but out of this restraint comes a sense of fervour. The cello’s cries are answered by sonorous piano passages that soon fragment into more crystalline lines. 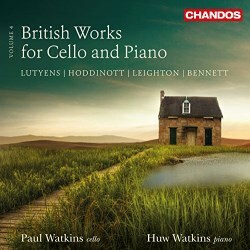 The subdued nature of the interplay suggests a keening quality, with tolling in the bass, that becomes explicit in the finale, the Canticle, where Anthony Burton’s notes reveal that the cello’s wails represent Lutyens’ own cries of ‘Edward, Edward’ – her late husband was Edward Clark – when he was dying. Ever slower and ever more mournful, this is an allusive but incrementally threnodic and powerful work. Written the year after Lutyens’ piece, Hoddinott’s Sonata No.2 is again spare, and trades on inversions of the melodic line. There’s something aloof and elliptical about this sonata and the first two movements do not sufficiently prepare the listener for the boisterous finale, where he finds a decisiveness earlier lacking. Richard Rodney Bennett’s 1991 Sonata was dedicated to Alexander Baillie and is cast in four movements with plenty of interesting features. One such is the early arrival of a cadenza, another is the use of a mute during the second movement – splendid textures to be encountered here – and the exciting, stalking piano figures in the Feroce third movement, which sounds like a mix of Prokofiev and Bartók. The most playful music in this disc comes in this sonata, not least in the finale, which is full of colour and dextrous interplay between the two instruments. It ends the disc on a decidedly unbuttoned note – not something that can easily be said of the remaining items. Needless to say the Watkins Brothers again perform wonders with these works, bringing a different character and colour to each. The recording is sumptuous and the booklet notes of high quality.